For anyone who has a chronic illness or is simply getting older, the amount of medications needed along with the times to take them can get overwhelming. 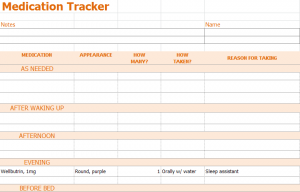 The Medication Tracker Template is a simple way to list all of your medications along with important details. Keep it handy for family members, medical staff, and yourself. Download the one page Excel sheet and open it. Begin by entering your name in the Name field on the right, and use the left “Notes” section for anything that indicates what the sheet is for – IE “For medical personnel in case of emergency”. Next move down to the rows for the medication entries and start by ordering your medicine according to the time of day you take them. Fill in the name of the medication and the dosage amount, the appearance (as many can look similar), how many you take in one day, how it should be taken (IE injection with an Epi Pen), and finally the reason you take it. This is important for medication such as nitrates which are taken in emergencies regarding the heart. Use the notes section to indicate anything specific such as “break pill in half due to size”. Keep a few copies of this filled in sheet available. You can use it to inform new doctors about your medications, give a copy to a family member in case of emergencies, and use it to check daily that you’ve taken all your medications. Update this sheet with any new or removed medication as soon as you can, to avoid any outdated information. You can add an additional column on the right if you want to check off daily if you’ve taken your medication. Just click the “G” at the top at the title it “Taken?”, then fill in a yes or a no throughout the day.